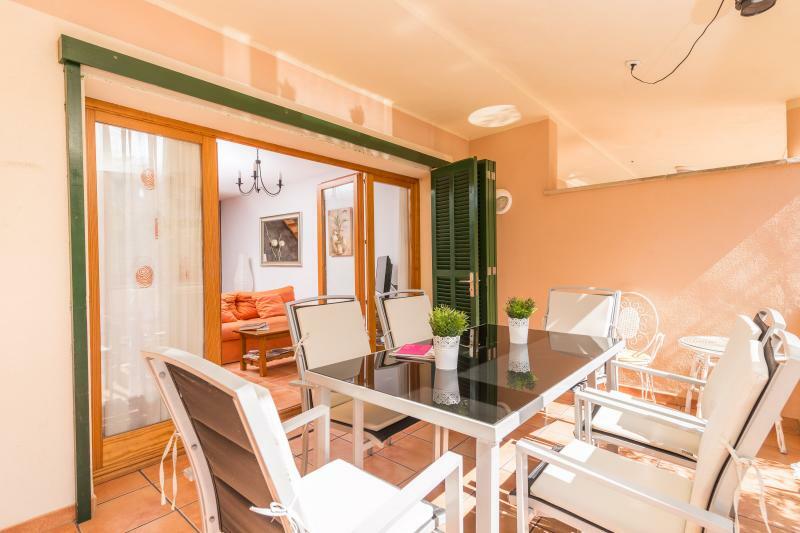 Welcome to this wonderful house with private access to the sea in Port d'Alcúdia. It is prepared for 8 persons +1 extra. 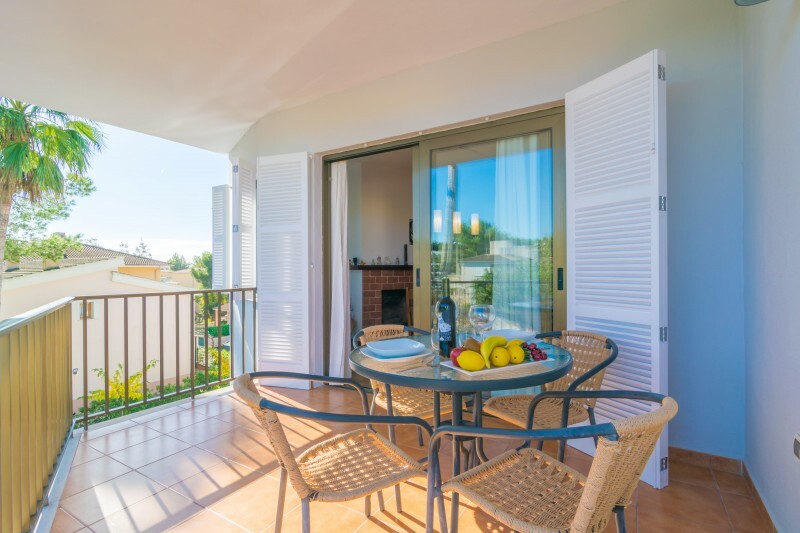 The fabulous outdoor area counts with a garden with direct access to the beach, three terraces with sea view, a well-furnished porch and a barbeque. The 220m2 2-storey house counts with 4 bedrooms: 1 on the ground floor (with a double bed) and 3 on the first floor (two with a double bed, of which one counts with an en-suite bathroom with a shower, and 1 with 2 individual beds). All bedrooms count with air conditioning. There is a possibility for one extra person to sleep on a sofa-bed. On request, there are two baby beds and a highchair available. There are 2 bathrooms with a bath tub, for general use (one on each floor). The cozy living- and dining room counts with 2 sofas, satellite TV, a dining table, a fire place and air conditioning. The independent kitchen works with a hob and counts with all necessary utensils to prepare a perfect family dinner. You will also find a washing machine, a tumble dryer, an iron and an ironing board. The whole house is equipped with central heating. The house is situated on the beach of Port d'Alcúdia. It's situation is perfect, with everything you might need within walking distance: supermarket, shops, restaurants, bars, pharmacy, bank, etc. The fine, white sandy beach of Alcúdia covers quite a few kilometers, all the way from the harbor of Alcúdia to Can Picafort. Nearby, you will find the beach of Playa dels Capellans, where you can enjoy a paella or a cocktail in any of the well-known beach bars, while watching the sundawn. Nearby, you will find some interesting places to visit, as, for example, the Albufera wetland, Pollença with it's cozy town square and the Calvari stairs, and small, quiet seaside villages as Colònia the Sant Pere. Don't forget to visit Alcúdia's old town, with it's cobbled streets, the church and the ruins of the old roman city and amphitheater. Tuesdays and Sundays there is a market in Alcúdia and the village transforms into a bustling and vibrant place. Garage available for 1 car. Outdoor parking space for 1 car. The house counts with two safety-deposit boxes and an alarm. Great stay, location is prime. Fantastic stay at a perfect place! Beautifull house with a gorgeous view! Everything you need is available here. Perfect! Die Kaffeemaschine sollte erneuert werden. leicht antiquiertes Mobiliar. Alles wunderbar, Terrassen, Betten, Bäder ,Garten und der Strand! Es war noch ruhiger als letztes Jahr, die Pumpe war kaum zu hören! Wir kommen wieder Hierher! Das Haus ist BESTE LAGE ! Stilistisch passend und "alles" vorhanden! Leider ist die Abwasserpumpe(Kompressor) der in der Garage arbeitet, laut, und stört etwas die sonstige Ruhe und Stille! Aber wir werden wiederkommen!! Super bolig til familieferie med små børn. Boligen har en dejlig aflukket have hvor børnene kan boltre sig, samt direkte adgang til den dejlige og meget børnevenlige strand. - Die Kaffeemaschine sollte erneuert werden. leicht antiquiertes Mobiliar. + alles wunderbar, Terrassen, Betten, Bäder ,Garten und der Strand! es war noch ruhiger als letztes Jahr, die Pumpe war kaum zu hören! Wir kommen wieder Hierher!